Sometimes gathered research may not fit into any one Family Research Folder in particular. This information is often valuable at a later time. Therefore, it is wise to group all the information in one folder, rather than labeling it by husband’s and wife’s names. There are several options available. 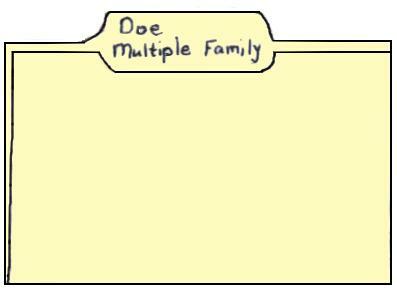 Later, when you finally find out which family your John Doe was a member of, you may extract that information and place it in a folder for ____ Doe and his wife (John Doe’s parents). Then, depending on your own preferences, you may keep or get rid of the rest of the material in the Multiple Family Research Folder. Whether you keep it or not, it will aid researchers, including yourself, later if you record the reasons you consider John Doe a member of one particular family. Keep this information in the appropriate Family Research folder(s). Another reason to keep research in a multiple family folder is if you receive many research notes on several families from one researcher or relative all at once. You may separate the notes into the various Family Research Folders they belong to, or you can extract the information desired and place the extracts in the proper Family Research Folders. The multiple materials received could then be placed in a Multiple Family Research Folder and labeled by the predominate surname. The name and address of the person you received the research from could also be included and the extracted material could be cross-referenced to the Multiple Family Research Folder. If several families come from the same city, it may be helpful to place maps and research for that area into one folder. As information is found for each particular family, extract or copy maps and research from the multiple-folder you have created into specific family folders. If you have several families residing in the same area you may find it helpful to group all the records from the local parish in one folder. Depending on how many churches are in the town, you may want to create a folder for each church or denomination. The same thing could be done for other types of records, not just churches. The information for each family could be extracted or copied and placed into that family’s folder.